One of the first games I ever played on the PC was King's Quest. Back then, the game pretty much blew my mind. Many other adventure games followed, until they eventually fell out of style. Companies like Telltale have been trying to bring them back. Over the weekend I bought one of their latest offerings, Hector: Episode 1. Hector is a relatively simple adventure game. You point and click to look at stuff and pick them up. Then you use the objects you have gathered to solve puzzles. Pretty much standard fare for this type of game. Not like the old days when you had to type what you wanted to do and hope you guessed the correct words. I've put in a little over an hour so far and I've heard the entire game takes 4 to 5 hours. That's not very long, but it is priced accordingly (~ $10). So this isn't a full review, nor does it contain spoilers. Humor. I find the game pretty funny so far. It is a bit raunchy, more like Leisure Suit Larry than King's Quest. Voice Acting. The voice active is top notch, and pretty much all British so far. Art. I'm also a big fan of the art style. It helps keep the game light-hearted and it is very effective. There are some funny animations as well. Gameplay. Things to click on are a must for these types a game, and Hector does not disappoint. You get a nice voice-over for everything, and a number of different responses for most items. The puzzles have not been too challenging, but I did have to use the Hint system once or twice. The Hint system is well done, as it just doesn't come out and tell you the answer. It'll insult you a bit in the process, which is a nice touch. The characters I have met so far have been interesting, and one a bit disgusting. The things you have to do in the line of duty. Result. 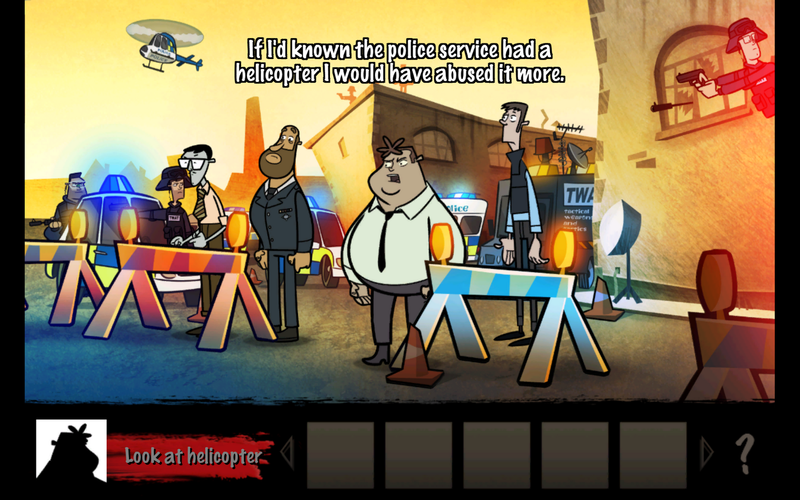 If you like adventure games and don't mind a bit of dirty humor this might be something to look into. Just know that it is a short game, and pretty British. I've come across many terms I have never heard before. Need to find myself a British English -> English dictionary. Great fun though.